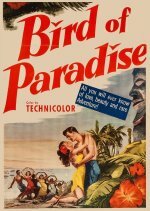 Bird of Paradise was originally filmed in black-and-white by RKO in 1932, with stellar leads (Joel McCrea, Dolores Del Rio), a top-class director (King Vidor) and loads of authentic atmosphere. This pointless Technicolor remake from Fox has no merit, despite being written and directed by the usually reliable Delmer Daves. As the white South Seas adventurer and the exotic native girl who fall disastrously in love, brooding Frenchman Louis Jourdan and tough girl Debra Paget are no match for their predecessors. The over-lush visuals engulf the human drama, and much of the film descends into idiotic fake ritual.